Arcen Games has just patched their co-op RTS, AI War, to version 1.301. With it brings a host of improvements to both the interface, ship graphics, new units, new network code and a host of other tweaks. 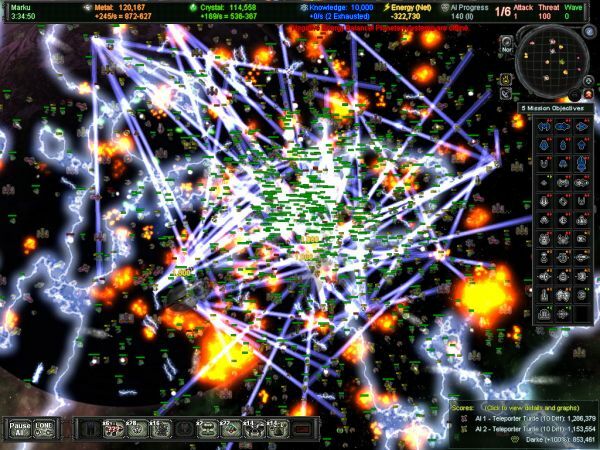 Considering the game claims you can have 30,000 units in a battle at once I'm sure the net code needs to be very neat and tidy for a lag free co-op experience. The best addition is the ability to drop-in and drop out of a co-op game whenever you want. A good update all around. While you wait for it to download, how about counting all of the units in that screenshot above? - 4 new ships: Decloaker, and three levels of a new Gravitational Turret. - Major visual improvements -- the HUD, the galaxy map, menus, and ship icons have all been revamped. We have updated our screenshots, which gives a nice before/after contrast. - Co-op Enhancements -- players can drop in and out of games if needed, and all ships can be swapped around between players much better now. - New "Supply" game mechanic augments the military importance of captured planets. - Several AI improvements to add better tactical intelligence in a number of different scenarios. - New UDP-based network code performs vastly better in high-latency or high-packet-loss environments. - New render caching performance improvement redcues GPU load in large battles by 1/2 to 2/3. - More updated battle sound effects, and an updated battle sound effect engine, makes the sounds of battles much better. - Resizable minimap -- helpful in particular for larger monitors, there are now 3 minimap sizes. - Force Fields controlled by players are now damaged by shots fired out from under them, but FFs can all now be moved and repaired. - Many other balance tweaks, ship logic improvements, and other enhancements and bugfixes.